Stationary Air Compressor Market size was estimated over USD 24 billion in 2017 and the industry will grow by a CAGR more than 3% up to 2024. Stationary air compressor market has been witnessing fast technological breakthroughs owing to increased investments by manufacturers in the research & development of newer and better products. Rising energy costs and regulations limiting the energy consumption of industrial equipment have led to the development of energy-efficient products. These products need lesser amounts of energy to run resulting in lower greenhouse emissions and increased energy savings. For an instance, Kaeser Kompressoren redesigned and launched a series of energy-efficient rotary screw compressors that could reduce energy costs up to 26% from the original design decreasing its life cycle cost. Such technological developments will contribute to the stationary air compressor market growth over the forecast period. The product availability with multiple fuel options that can provide a varied range of supply pressure is another technological advancement that is likely to augment the industry growth. Products with design features that reduce maintenance cost have also gained popularity in recent years. Such innovations and enhancements in the industry are likely to continue in the future and will boost the product demand for a variety of industrial operations. The product size is a key factor restraining the stationary air compressor market growth. The product size tends to increase with increased capacity. Bulkier size results in higher amounts of noise and air pollution along with problems related to space limitations. Larger machines are also less efficient than smaller ones leading to higher energy consumption, thus hampering the market growth in future. Global stationary air compressor market is segmented on the basis of technology which include rotary, reciprocating and centrifugal. Among these, rotary segment accounted for over 60% share of the entire segment in 2017 and is expected to grow substantial growth rate in future. Rotary one is mostly used in manufacturing sector owing to its superior features such as high efficiency, minimal installment & maintenance cost, etc. In terms of revenue, reciprocating stationary air compressor will grow with more than 3% CAGR throughout the forecast spell as the product is extensively used in industrial applications for providing more power. Growth in industrial sector in emerging economies will boost the product demand over the forecast period. The market is bifurcated into lubrication type which include oil free and oil filled stationary air compressors. 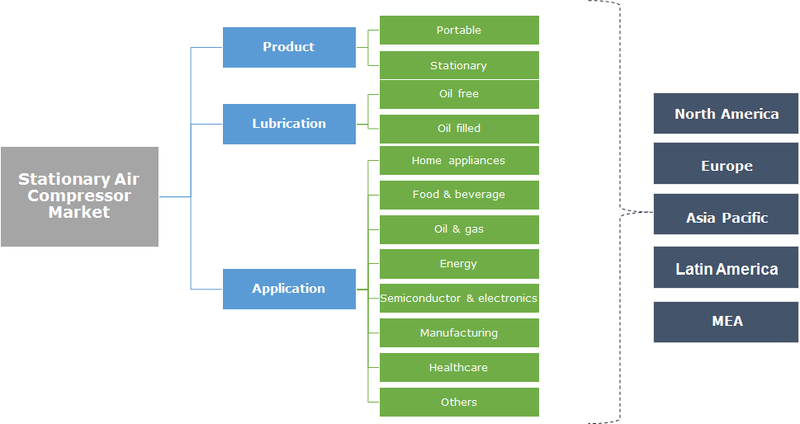 Based on volume, oil free stationary air compressor is said to grow by over 3.5% CAGR in coming years due to its high acceptance in healthcare and food & beverage sectors. Several regulations are also supporting for cost-effective operations like Chinese government has announced stringent protocols related to the protection of environment, which has eventually increased the demand for energy-efficient equipment. On the basis of revenue, in 2017 oil filled stationary air compressor market generated around USD 15 billion and is said to grow at a significant CAGR by 2024. This type is employed in various type of thermal plants, nuclear power units, and related applications due to their low cost, high capacity and efficiency. The oil filled machines are mostly used in drilling, mining and quarrying activities to power drilling equipment. This will further augment the oil filled segment demand by 2024. Based on revenue, home appliance application segment generated more than USD 6 billion in 2017 and will likely grow at substantial rate over the forecast year. Hermetic compressors are used in refrigeration systems, air conditioners, freezers and other household appliances in order to compress the refrigerant gas in the system. Growth in house hold appliances market in developing countries will positively influence the entire stationary air compressor market in coming years. Food & beverage application segment is said to grow at significant CAGR of more than 3% from 2018 to 2024. Oil free stationary products are widely used in this industry for packaging, storing, and handling food products due to the need for contamination-free and consistent compressed air supply in order to run the operations. 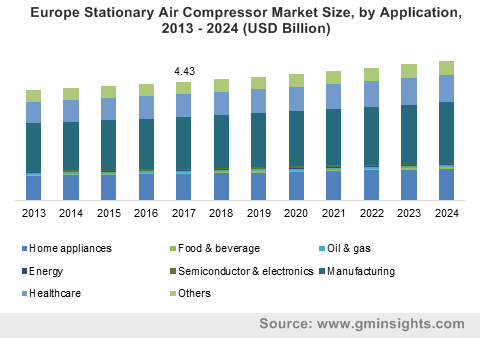 Based on revenue, the U.S. generated more than USD 3 billion in 2017 and will be a key contributor in the stationary air compressor market over the forecast time. This is all due to the positive demand for home appliances coupled with growth in oil & gas exploration activities in North America region. In 2017, UK and France combinedly generated revenue around USD 700 million and will witness sluggish growth in the coming years. Germany and East European countries will witness a significant increase in the product market. This can be attributed to the upsurge in manufacturing activities in the Eastern European region coupled with significant automotive production and assembly. Global stationary air compressor industry is categorized by the existence of several manufacturers and few of them are Rolair Systems, Ciasons Industrial, Atlas Copco, Gardner Denver, Ingersoll-Rand, Sullivan-Palatek, Kaeser, Bauer Compressor, Gen-Tech and others. Majority of the companies are engaging in the product enhancement, developments and expansion. For instance, In June 2017, Kaeser Kompressoren launched a redesigned FSD series of rotary screw air compressors to deliver an energy efficiency advantage with maximum air & pressure flow capacities and this will further reduce the overall life cycle costs of the product. Global stationary air compressor market will witness a significant growth in terms of demand due to its diverse application areas. Upsurge in demand for household appliances like air conditioners, refrigerators, etc with change in living standards in emerging countries will substantially stimulate the demand for stationary air compressor over the forecast timeframe. Additionally, increasing demand for automobiles, growth in oil exploration & mining activities, and expansion in power & energy generation industry will significantly drive the stationary air compressor market growth in future.